One of the things that has always fascinated me about the used machinery business is the daily assessment of risk and reward in the deals we go into. Every deal for my company Graff-Pinkert is inherently a gamble on the future value of a discarded machine tool. It also is a judgment call on the risk assessment of our competitors who may or may not know about a machine we have interest in. I think I understand the risks after being around the game for my entire business career. But I often wonder about my customers who make big bets on automotive or military contracts, knowing that some of the risks may not be apparent when they bid. I have heard of so many projects which demanded hundreds of thousands or millions of dollars of capital investment, only to be canceled out after a month or a year of operation. In the high production turned parts arena there is a fascinating opportunity popping up with the enormous recall of Takata airbags taking place by Honda, Toyota and a host of other auto companies. The car companies, at the behest of the U.S. government, are recalling 34 million airbags because about 100 of them have prematurely fired over the last 13 years. The occurrences are associated with heat and humidity causing a degradation of the propellant mechanism, which potentially results in shooting metal shards at a driver and passengers. For the companies that have the money, expertise and guts to bid on the Takata work the rewards could be enormous. This kind of volume is rare today, even for automotive vendors. But with airbag work, the players know that there have been many washouts of audacious turned parts firms who dared to venture into the Takata briar patch, along with some big winners. For those companies who want to capture airbag contracts this time around there are additional roadblocks. Lenders who normally might have jumped at juicy capital equipment loans for solid machining firms are scared of airbag replacement work because of the sheer magnitude of the recall. This is a “Tylenol sized” event. Takata of Japan, along with Autoliv, and TRW produce most of the airbags, Takata with its closest ties to Honda and Toyota. Takata invented the airbag 25 years ago and has ridden it to riches, but this colossal recall could devastate the company. Some people think the recall could put Takata into bankruptcy, but the people who are gambling on making the parts believe the company is too important to the car companies to allow it to fold. It is the Toyota, Honda, GM, BMW, etc. name on the recall, not Takata, which means it is highly unlikely the airbags will not be provided. Who pays for them is a question mark, but the smart money is on somebody paying for the hardware and installation. The buyers of parts might be slow in paying as they work out who is financially responsible. Another unknown is how much business will end up with Autoliv and TRW, the other big airbag players. But Takata desperately needs parts now and they are inclined to place work with experienced suppliers. For them it should be a bonanza. Unless the unforeseen happens—which as Takata certainly knows—can occur. 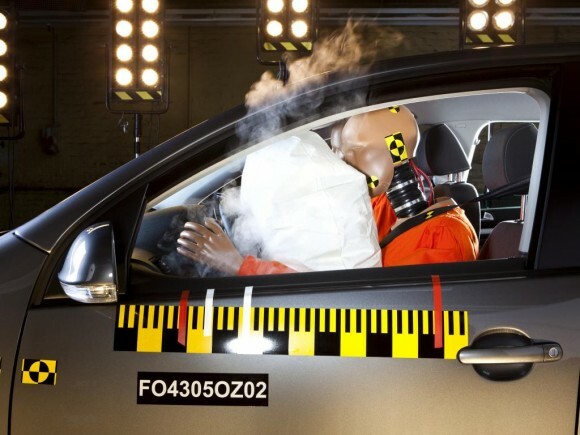 Question: Is the safety rating the first thing you consider when you buy a car? Lloyd Graff is a Writer and the Owner of Today’s Machining World, and also runs Graff-Pinkert, a used machinery firm in Oak Forest, IL. The Buyers of parts in the automotive world cannot be near as slow to pay as the buyers of tools / tooling in the automotive world. You are lucky if you get paid in 18 to 24 months after delivery of a tool. These college educated thieves expect a 1 to 20 man shop to hold an interest free note for them for that long. GM, Ford, and Chrysler need to use their own money to operate their business. No it’s not the first thing because people cannot objectively evaluate the risks for themselves. When I bought my daughter her first car it was an old Volvo because of their reputation, but I’d never buy one of those for myself. Too clunky. However your attitude seems to indicate that you wish the government would get out of the business of requiring safety standards. I shudder to think what would happen if that occurred. Sorry, that is the role of government. The first car I ever had with an airbag was a Mitsubishi colt. I didn’t even know it had an airbag until it was stolen! I look for value when I buy a car. I just wanted to point out Takata did not invent the airbag 25 years ago. The first airbags were installed in some GM cars in the early 70s and the system was developed by GM. However, the true invention of the airbag happened in the 1950s.